The Six Pack Show invites TCAA members to submit a piece that fits within the space of a six pack of longneck bottles (5 1/2" x 7 1/2" x 9 1/2"). 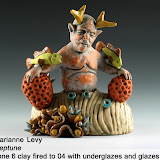 This year, we held our annual show at the Coop Gallery, in conjunction with San Angelo Museum of Arts Ceramic Weekend. Since 1999, TCAA has held an annual exhibition, open to all current TCAA members. In 2006, the annual members' exhibition, formerly known as "Attachments" took on a new name: "The Six Pack Show". Members were invited to submit work that fit within the dimensions of a six pack of longnecks. The result was a fun and imaginative exhibit that became an annual tradition. 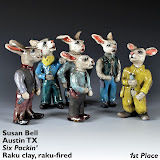 Every other year, the exhibition is held in conjunction with San Angelo's Ceramic Weekend, which includes National Juried Exhibition, visiting artist workshops and several other fun clay events. On odd numbered years, the exhibition is held in other cities around Texas. Our 2017 show was held at the Rockport Center for the Arts, May 20 - June 10, 2017. Special thanks to our 2017 juror, Louis Katz. 1st Place: Niko Weissenberger - "Flask"
2nd Place: James Miller - "ALBACHTEN"
3rd Place: Renee LoPresti - "The Distance Between Us"
Honorable Mention: Mary Fischer - "Blue House"
Honorable Mention: JW Taylor - "Wood Fired Cup"
Honorable Mention: Lenise Perez-Miller - "Bathroom Blues"
Honorable Mention: Kristopher Jorgensen - "Lidded Jar"
Honorable Mention: Danville Chadbourne - "ARBITRARY PERILS"
Honorable Mention: Billy Ray Mangham - "Head on Wheels"
Our 2016 juror was Howard Taylor, Director of the San Angelo Museum of Fine Arts. 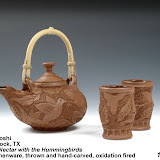 The Coop Gallery is located at 427 South Oakes St across the street from the San Angelo Museum of Fine Arts. 1st Place: JoLea Arcidiacono - "Untitled"
2nd Place: Kathi Herrin - "Breaking Wave"
3rd Place: Marcia Selsor -"Cragged Twist"
Honorable Mention: Cole Brown - "Tezón Nebulosa"
Honorable Mention: Susan Calafrancesco - "Apocalypse"
Honorable Mention: Sarah Friesema - "Fan Pitcher"
Honorable Mention: Shikha Joshi - "Co-exist..."
Honorable Mention: Chris Leonard - "A Pair of Purring Pots"
Honorable Mention: Bob Swaffar - "Wood Fired Bottle with Glaze Bubble Stopper"
This year's juror was Plano artist/professor, Chris Gray.